Isn’t it strange that a band with the crazy longevity of the Grateful Dead would release the two most polished and focused studio albums of their entire career so early on and within mere months of one another? Obviously, The Dead played by their own rules. They were far more interested in living life on their terms, out on the road where the real party was, playing host to their own unique brand of existence (with help, of course, from their ever loyal following). As a result, there is certainly no shortage of live performances available. 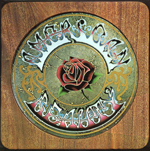 But for the fan seeking the archived purity and perfection that can only be achieved via the production of a studio album, Workingman’s Dead and American Beauty stand tall as the precious missing links in the vast Dead catalog. As I come to terms with how to embark upon a journey into either album (I’m choosing American Beauty almost at the flip of a coin), it seems impossible not to follow the band’s lead and head back out to the road itself. Really, where else? And so, key in ignition, away we go. It begins with my first ever journey into God’s country—the incomparable Rocky Mountains. It was happening so fast that I needed to stop and see if there was any way to try and soak in the moment. The day could not have been more perfect. There wasn’t a cloud in the sky. Roosevelt National Forest was swallowing me up. I decided to pull off to the side of the winding road to take a slow and deliberate breath, as if to convince myself this was actually happening. I wanted to remember it forever, capture the moment and lock it up, a box of rain that I could open up again and again, whenever I needed to tap into the magic. My solo cross-country trek had gone without a hitch. With every last mile marker, I was basking in the euphoria of a newfound freedom that I had not quite tasted before. My final destination was San Diego where I would sow the seeds of a brand new existence. As for possessions, they were few. I took with me only that which could fit into the cramped confines of my boxy red Jetta. Of course, a healthy catalog of tapes and CDs took up much of the space. Maybe too much. As I began my ascent into the mountains, it was becoming brutally clear. Honey, you ain’t seen anything yet! Although the road itself, independent of the specifics of any particular location, carries its own allure, you can only enjoy the flatlands of Illinois, Iowa, and Nebraska for so long before you begin to itch for a little more of a wow factor. In Colorado, I found it in spades, as if I had swallowed a pill that transported me to Wonderland. The Dead were alive in my Volkswagen speakers and The Rocky Mountains were no longer a legend. Dreams were no longer the playground of fantasy. It’s crazy when they hit, these moments in life that are so obviously elevated from the pack. You experience unadulterated exaltation. The sun walks on water and shoots a Rocky Mountain stream straight into your soul. As my friend Rich might say, I’d sprung a leak! I was leaking all over Estes Park! Jerry Garcia and the boys were kind enough to serenade me sweetly during this life-changing moment, my first “go west, young man”-cross-country road trip. (More would follow.) The sensory overload was fantastically overwhelming. After a few days, I would come down (slightly) from my Rocky Mountain high. There were new wonders to discover. I sat for hours, lost in centuries of history beside a delicate arch in Utah. I walked through a petrified forest and witnessed more changes in landscape in just one trail than I had seen in my entire Midwestern existence. I wandered around a limestone sinkhole in Arizona—Montezuma Well—and tried to come to terms with the power of this lush desert oasis. At sunset, I watched as nature became an impressionist painter and Joshua Tree National Park became her canvas. Oh, the riches of it all. The road trip offers a mainline to the beauty of the land. As for The Dead—so many roads, so many roads—what an amazing road-mix they provided me for the trip, the perfect soundtrack for the traveler. Jerry is gone, back together again with old friends, Pigpen, Keith, and Brent. The mourning continues. But as is always the case in this life of limitless beauty and perpetual motion, we just keep truckin’ on.